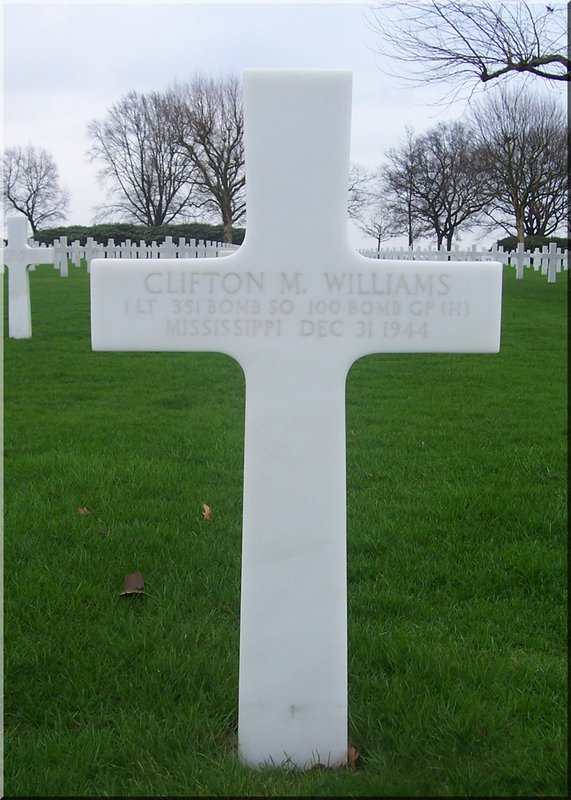 Clifton Williams was born on July 21, 1923. 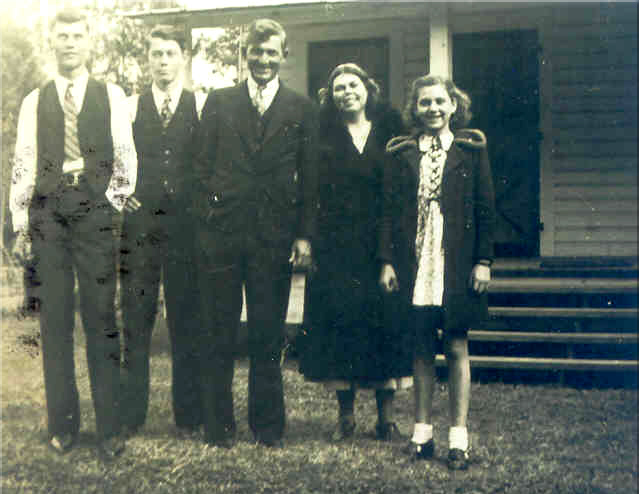 He lived with his parents Clifton and Irene, his brother, Rudoplh, and sister Marjorie in Escatawpa, Mississippi. Clifton studied at the Aviation University of Tennessee in Knoxville. He had many girlfriends, but was not married. Picture of the Williams family. Clifton is second from left. 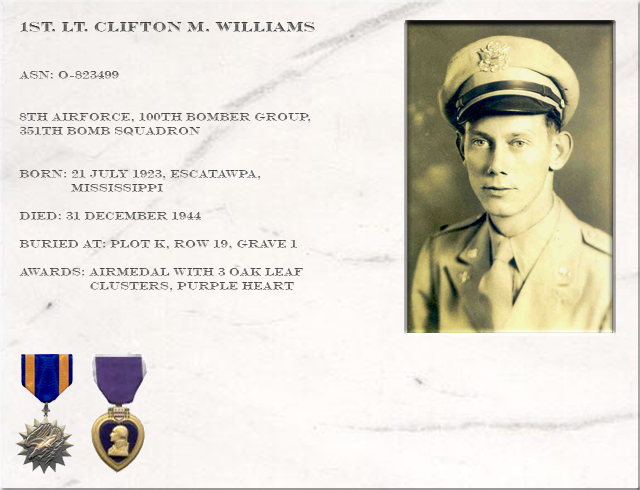 When the US came into the war, Clifton joined the airforce and became a member of the 351st Bomb Squadron, 100th Bomb Group (H). 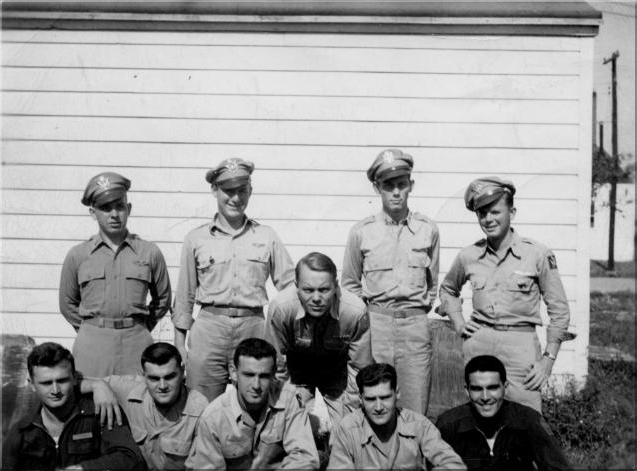 He was trained to become a pilot of a B-17 "Flying Fortress". He started as a 2nd Lieutenant but eventually promoted to 1st Lieutenant. The 100th bomb group "Bloody Hundredth" was founded on June 1, 1942 at the Orlando army airbase, Florida. In December 1942 the group excisited out of 39 crews of 10 men per crew. After training in the US the crews flew to England. The groundpersonnel followed later by boat. Their base Thorpe Abbots was about 20 miles south of Norwich and was under command of the 8th airforce. The group now excisted of 4 squadrons the 349, 350, 351 and 418 squadron. The100th bomb group flew it's first combat mission on June 25, 1943 and it's last on April 20, 1945. In these 22 months they flew 306 missions including 6 food-drops over the Netherlands in May 1945. In total they flew 8630 sorties and dropped 19752 tons of bombs and 435 tons of food. The average lifetime of a crew was 11 missions. Between 1943 and 1945 the 100th bomb group lost 229 aircraft, the losses mostly came in large numbers. For example; from a mission to Munster, Germany only 1 of 13 planes returned on Thorpe Abbots. The group participated in the European airwar, Normandy, Northern France, Rhineland, Ardennes and Central Europe campaigns. In December 1945 the 100th bomb group returned to the US where it was de-activated on December 21. On the 31st of December 1944 the crew flew it's 25th mission, the target was Hamburg, Germany. When they started their bomb run, their plane and the plane above of them was hit by flak. The 2 planes collided in the air, breaking 1Lt. Williams' plane in two at the ball turret. Both airplanes went burning to the ground. 3 crewmembers survived the crash and were taken POW. Clifton died at age 21. 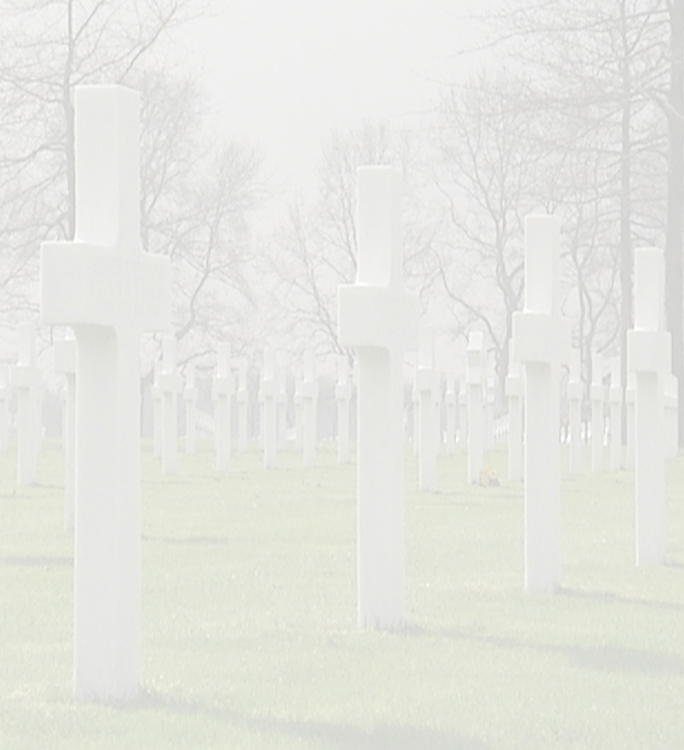 3 other crewmembers are buried beside him at the Margraten cemetery. "While we were on the bomb run the tail gunner called out an enemy jet high at six o'clock. In answer I checked the crew for oxygen and gave orders to all the gunners to be especially alert for enemy fighters. All action began just as the squadron dropped their bombs. I only had time to say "Bombs Away" when two terrific explosions took place; one under the nose in the chin turret, the other some where around the center of the ship. The one under the nose was flak, and pieces of metal seemed to fill the air as they tore thru the Plexiglas and aluminum. It was at this moment that I received a hit over the left eye that stunned me. From then on, nothing is clear in my mind as to what happened. We immediately went into a spin and I remember trying to climb to the escape hatch but I didn't have strength to overcome the other forces. The plane straightened into a dive and as I disentangled myself from all the debris I pulled the red cord on my flak suit, and started again for the hatch. In that one quick moment I glimpsed the navigator lying on the catwalk on his elbows looking in my direction. This covered a fraction of a second and then the nose seemed to disintegrate and I passed out. When I came to I was in the open air and just automatically pulled the ripcord of my parachute. But nothing happened except the red handle came out - I threw it away and opened the chute by pulling the flaps open. I never remember the jolt of the chute opening - the next thing I knew was that I was dangling by one strap It was a habit of mine to hook one side of the harness to the chute on the bomb run and it never occurred to me to fasten the other side before opening it. By this time, the bleeding of my wound had stopped - evidently because the blood over my face had frozen. However, hanging by one strap prevented me from having any control over myself and I whirled around and around like a top, making me very sick at my stomach. I made hasty plans as to evading, but when I landed it was within a fenced-in estate on the edge of Hamburg. I was immediately surrounded by soldiers and civilians They took me to the Luftwaffe base where three others from our squadron were being searched and held. One was my waist gunner and he is the one who told me the story of our plane. The other explosion I heard was another plane colliding with us, slicing our plane in half at the ball turret. When I was a prisoner, the wound over my eye thawed out and began to bleed again I tried to get it bandaged but to no avail, so I bandaged it with a handkerchief, and it was over a month before it finally healed."